Stress injuries are often thought of as injuries that occur at desk jobs or from repetitive movements in the arms and back. Employees may suffer from chronic back pain or carpal tunnel syndrome and require workplace modifications in order to complete their day-to-day jobs. Equally common, although less well known, are repetitive knee injuries. These injuries can arise from positions that require frequent lifting or squatting, and can result in severe knee pain. While repetitive knee injuries can be just as debilitating as any other repetitive stress injury, they can be difficult to prove in a workers’ compensation claim because of the many other circumstances that can give rise to knee injuries. Employees who suffer an injury to their knee as a result of their work are entitled to seek workers’ compensation to deal with their injuries, and cover time off the job while they rehabilitate. If the injury is caught early on this can be as simple as some rest and time with a physical therapist. If the injury is allowed to continue to worsen, an employee may end up needing compensation for significant knee surgery. In a worst case scenario, the injury can become so unmanageable that temporary disability is required. When trying to bring a claim for a knee injury arising out of repetitive motion, the biggest challenge for an employee is establishing that the injury is a result of work conditions, and not something outside of the job. There are many hobbies and circumstances that can give rise to knee injuries, and your employer’s insurance company will be quick to point to those factors as the true reason for your injury. For example, if you have an old sports injury from playing football or soccer in high school or college, an insurance company may argue that the pain your experiencing is a result of that prior injury, and not a new injury you received on the job. Or if you spend your weekends painting houses, and are up and down ladders all day, they may try to argue that you hurt your knee that way. Because we use our knees in so many different activities on a daily basis, it can be particularly challenging to prove that your work was the cause of your knee injury. 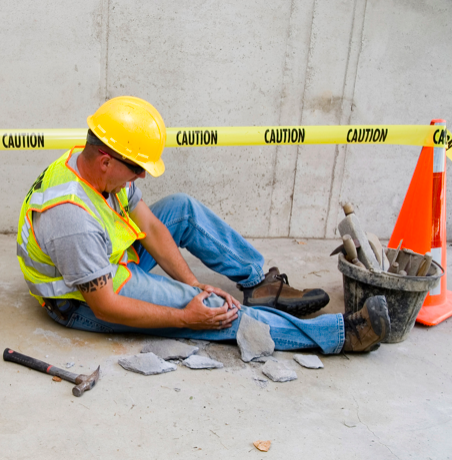 The best way to avoid this difficulty is to carefully document your injury, and keep clear medical records showing how the symptoms of your injury are connected to the challenges of your job. Let your medical provider know that you have this concern, and ask them to work with you carefully document these issues as well. To determine if you have a potential WEAR and TEAR claim, schedule a FREE CONSULTATION with one of our Physical Therapists. You can call 610-730-4572 to schedule it today! At Robbins Rehabilitation, we know you work hard; now let us work hard for you.